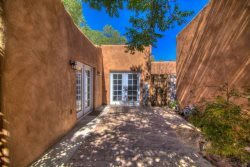 Gorgeously remodeled and preserving it's elegant Old World Charm, this home is the gem of Classic Santa Fe living! You surely won't be disappointed with your stay in this immaculate home. It is thoughtfully designed with high-end luxury furnishings and comfortable King beds. It offers privacy yet is literally steps to the popular Tea House and other restaurants. If you feel like hiking you are a short 5-minute drive away to popular hiking trails. If you ski, you are an easy 20 minutes away! This home features a fully equipped Kitchen with top-end cookware and bake ware to enjoy cooking at home! We provide spices to assist in food preparation! Enjoy the Keurig with an assortment of coffees. We also have a toaster, blender, microwave and wine cooler! If you're not the cooking type while on vacation, no worries, you're in luck because you will be next door to the Tea House or across the road from El Farol! Also, we have Xfinity TV and high-speed WiFi and nice cozy King Size Beds! The home is set up exclusively for you! You will find an instruction book that will give you information about the Cable TV, Internet, local restaurants, venues, and more!!! I'm only a phone call away to assist you in anything you need! This home rests in the self-proclaimed historic district of Santa Fe, and is literally around the corner from the popular Canyon Road filled with Art Galleries, and restaurants! Make the Tea House your breakfast or lunch spot right next door! Spices, baking ingredients, coffee assortment, etc. Some spaces are shared - The property is private and the iron gate access is shared with the owner in the back. Please do not block the neighbors' ability to access the drive.